Fountain Square in downtown Evanston. Due to construction, Evanston’s annual tree lighting ceremony had to be moved from its original location to Church Street Plaza. ‘Twas the month before Christmas, and all through Evanston, the search was on for the right spot to light the city’s holiday tree. In past years, the city has held its annual tree lighting at Fountain Square in downtown Evanston. 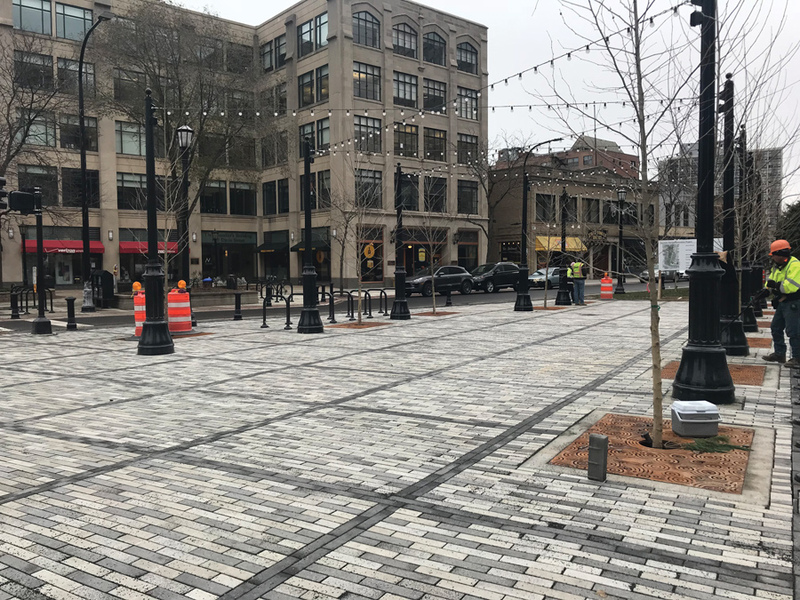 But in April, the city began construction on the square, which has since experienced multiple delays due to weather and coordination issues. With renovations currently on hiatus because of dropping temperatures — the project is expected to finish in May 2018 — the city had to seek out a new location. This year’s ceremony will take place Dec. 9 at Church Street Plaza, at the intersection of Church Street and Maple Avenue, said Annie Coakley, executive director of Downtown Evanston — a business nonprofit in charge of orchestrating the tree lighting. Church Street Plaza, located a few blocks from the original location, has put up its own tree for the past two years, Coakley said. She said this year her organization collaborated with the plaza’s management to take advantage of the space as a new venue for the ceremony. Lori Stein, director for commercial property management at McCaffery Interests — the real estate company that manages tenants around Church Street Plaza — said the tree was installed about a week and a half ago. The tree is artificial and stands 18 feet tall, Stein said, noting that it is the same tree that has been used in recent years. Evanston has historically used real fir trees and plans to plant a permanent tree as part of the Fountain Square renovation, eliminating the need for the city to search for a new tree every year, Ald. Melissa Wynne (3rd) told The Daily in 2016. Traditionally, there is a procession through Evanston — with fire trucks, the mayor and an appearance by Santa Claus — before the tree is lit, but Coakley said the new location will not allow access for a procession. Instead, she said, there will be performances from various choirs and professional carolers. Coakley said she hopes the carolers will be able to lead attendees in a group rendition of “Rudolph the Red-Nosed Reindeer” — a holiday classic based off a poem written in 1939 by Evanston native Robert L. May. She added that her organization plans to distribute red noses to tree lighting attendees for the occasion. This year’s ceremony will mark the first time Mayor Steve Hagerty lights the tree, and Coakley said he is expected to make remarks before the tree is illuminated. Ald. Peter Braithwaite (2nd) said he is happy to host the event in his ward this year but looks forward to returning to Fountain Square in 2018.